There are a lot of good reasons to get solar panels in Los Angeles, from the money saved on the electricity bill, to the increased value to the home, and the reduction in the emission of greenhouse gases. As the cost of purchasing a solar panel system—aka a photovoltaic (PV) system—continues to fall, more residents are ready and willing to install a system on their home. However, before the system can be installed, homeowners need to know the rules and requirements for solar installation. Before purchasing a PV system, the buyer should know whether their home is compatible with such a system. This starts with the roof, if it is too badly damaged, then a solar installation may not be compatible because it will not be able to be mounted securely. If the roof needs renovation, then that renovation should be conducted before the panels are installed. Conducting the renovation after a solar installation is expensive and inconvenient because the panels will have to be removed and then re-installed by professionals. The homeowner should also make sure that there is not any significant shade covering the roof for most of the day, particularly at noon, when the sun is at its brightest. If the shade is most significant in the morning but dissipates at noon, then the removal of the obstacle is not necessary since the system will be receiving the full power of the sunlight when it matters most. Any shade will prevent the system from performing to its full potential. This could result in the system providing significantly less energy to the home than it normally would. This in turn could result in higher energy bills, meaning that it will take much longer for the system to pay for itself. If there are any potential shade-causing obstacles, then, if possible, they should be removed or reduced so that they do not prevent the sunlight from shining on the panels. Before making an alteration to a building, whether it is commercial or residential, the owner should check with the city to find out if a permit is required. If the alteration is made without approval, then the owner can get fined and the alteration will have to be removed. This rule applies to solar panels as well. Permits have to be paid for, but getting one is preferable to being fined. Each California jurisdiction has its own regulations, so the homeowner should make certain to find the codes and regulations for their area. Fortunately, California has taken measures to reduce the red tape and the cost of acquiring permits for solar panel installation. Said permits can be attained by two different means: by the homeowner, or by the installer. Usually, the installer will be the one to request the permit and schedule the necessary inspections, so the homeowner does not have to worry about that aspect of the installation. The roof has only one layer of roofing material. The roof structure appears structurally sound, without signs of alterations or structural deterioration or sagging. The plane of the modules (panels) is parallel to the plane of the roof. There is a gap of minimum 2” and maximum 10” between the underside of the module and the roof surface. Modules do not overhang any roof edges (ridges, hips, gable ends, eaves). The modules and support components combined weigh no more than 4 psf for photovoltaic arrays or 5 psf for solar thermal arrays. The array covers no more than half of the total roof area comprising all roof planes. A roof plan showing the module and anchor layout is provided to the field inspector. The plan shall also show the roof rafter layout. Solar support component manufacturer’s project-specific completed worksheets, tables with relevant cells circled, or web-based calculator results are attached to the plans. A roof plan showing the module and anchor layout is provided. The plan shall also show the roof rafter layout. 5/16” diameter lag screws with 2.5” embedment into the rafter are used, or the anchor fastener recommended by the manufacturer’s guidelines, whichever is more stringent. Structural design shall follow the “Structural Criteria for Residential Flush-Mounted Solar Arrays” in the California Solar Permitting Guidebook. The permits and requirements may seem obscure and technical to the layperson, but the solar installer will take care of the majority, if not all, of the measures that need to be taken before the installation. 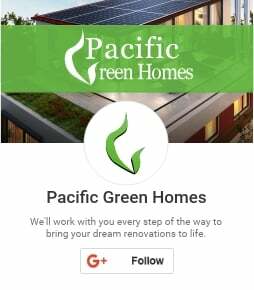 If you want to know how Pacific Green Homes will help you with all the rules and regulations, then do not hesitate to contact us. We are ready to clear up any questions you have regarding the installation of a solar array on your home.